I’ll be completely honest here, I am an IBM Model M snob. I’m not ashamed of it, either. The buckling spring keyboard was created to duplicate the feel and response of the Selectric. It was and remains on of the best keyboards on the market. Yes, I did say “remains.” Many people may not realize it, but the original Model M is still made by a company called Unicomp. They were spun off by Lexmark which was spun off from IBM. This keyboard is the gold standard, as far as I’m concerned. What makes a mechanical keyboard special is in how the keystroke activates. Most contemporary keyboards use a rubber membrane dome to activate the keystroke. When you press the key, the membrane is pressed down and closes a contact, registering the key. In a full stroke keyboard, this means that the finger moves down 4mm and thumps the bottom of the key travel for every letter you type. This is not only a lot of wear and tear on the fragile rubber but also on your hand. These accumulated tiny impacts are a big part of the repetitive strain injuries associated with computer keyboards. Another, less commonly considered aspect is that by rebounding off the bottom of the stroke, the antagonistic muscles in the wrists/arms do not have to pull the fingers up. The result is uneven development of the muscles and a “crunching” of the carpal tunnel. A mechanical keyboard, by contrast, has the same 4mm of travel. However, the mechanical switch in the key activates at about 2mm of that travel. In the case of the typical Cherry switch, it activates at 2.2mm. Once you have adjusted to a mechanical keyboard, you find that you are not hitting bottom on your keypresses. You also find that the muscles in the top of the forearm are now being used to pull the finger up. The net effect of this is that you have eliminated the impact injury and also – by having to pull up again – helped open the carpal tunnel. Not only is the injury eliminated, but I have found that I can typically type 10-15 words per minute faster on a mechanical keyboard. It also promotes the good hand position we were taught in typing class but promptly forgot when we starting programming. Finally, I have found I can type longer and with far less fatigue than even on an ergonomic keyboard. It was the buckling springs of the original IBM Model M that brought all this to the computer world. So why am I writing this if I think the buckling spring is so good? And why did I switch? First of all, understand that there are a variety of other mechanical switch keyboards that are quite good. The one most familiar to people are the Cherry MX switches. These keys are coded by color. Blue is a “clicky” key with the tactile bump and click similar to the Model M. Reds lack any click and are silent. Browns will give you the “bump” that the finger can feel but are very quiet. They fall in between the Reds and Blues. Frankly, I do no like Cherry Reds at all. I expect to feel something when I type. Cherry MX Blues, are an acceptable second place alternative to the buckling springs. My biggest complaint is the slight delay between the click and when the key registers. Also, I tend to prefer the action of the Model M slightly better than the Cherry, in particular I like the reset of the buckling spring a bit better. Understand, Cherry Blues are great. I do like them. Cherry Browns are acceptable, as well. However, I think the buckling spring keyboards are still better. This finally brings me to the whole point of the review: the Razer BlackWidow. To take these in order, ditching the numeric keypad is not just about cutting costs. It is an option that a lot of gamers like. It reducing the size and weight of your keyboard and eliminates keys that you generally do not use. This makes the keyboard lighter and easier to transport when you take it to a tournament. For this reason, a Razer keyboard without the numeric keypad is called a Tournament edition, or T.E. keyboard. Razer also provides a variety of options on backlighting. The most basic keyboards have no backlight. The Ultimate edition keyboards have a green backlight and in the 2016 version, key lighting is individually programmable (earlier versions, you could just set the intensity level). This costs a bit more than the non-backlit part, of course. At the top of the food chain is the Chroma edition keyboards. 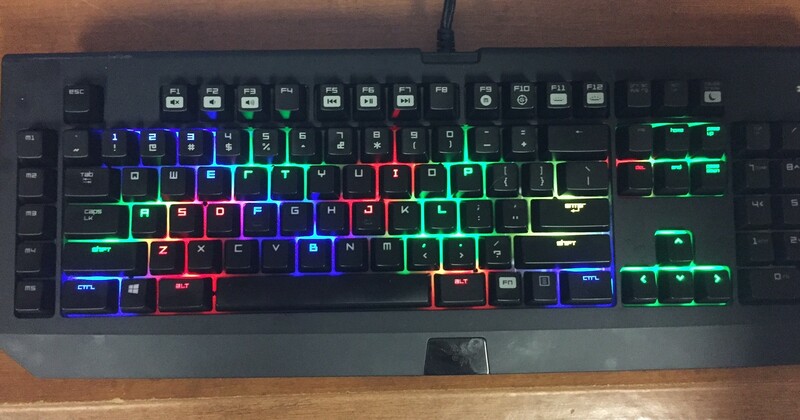 These keyboards have fully programmable multicolor individual backlights. People seem to like to play around with clever effects in backlighting, but in my opinion that’s a waste of time and money. There are however, some very practical uses for backlights. If you’re a gamer, you are often playing in the dark or in reduced lighting. In these conditions backlights provide obvious help in seeing the keyboard. I don’t do that kind of gaming, so it’s not much of an influence. Backlights do, however, have a use that I do appreciate: keyboard templates. The Razer Synapse software allows me to quickly put together a template for the keys I use in any particular program. For example, I use Audacity for podcast editing (I actually prefer it over Pro Tools for this task, but that’s another article…). The picture to the right shows my most frequently used keys mapped to color groups based on related function. This might sound silly, but I found that in practice it really does speed up the editing process. Of course, the real purpose of the a keyboard is to allow you to type. Until a couple years ago, Razer used Cherry MX switches. Then in 2014, Razer released their keyboards using their own switches. Their claim is that these keyswitches are designed specifically for gaming. The key feature of them is that they have a faster actuation and reset. As I said earlier, Cherry switches activate at 2.2mm. Buckling springs actuate at 2.4mm, by the way. The Razer switch activates at 1.9mm, 0.3mm faster. Likewise, once actuated, they key can reset correspondingly faster. 0.3mm may sound like a very small distance but you can actually feel it in use, especially if you are already used to a specific switch on a mechanical keyboard. There is also more of a tactile feel compared to the Cherry switches. Finally, like the Cherry Blue, it has a 50g activation force. This is a bit lighter than my old Unicomp, but when taken as a whole with all the other technical aspects provides a superior experience. My particular switch is the Razer Green. This is the loud, clicky switch comparable to the Cherry Blue. There is also a Razer Orange switch. This alternative is similar to the Cherry Brown. It has a slightly lower force required, 45g, and while it still has the “bump” feel, it is doesn’t have the loud click. This latter is available in the “Stealth” version of the BlackWidow models. So how does all of this translate into typing? Don’t be fooled. This keyboard is not simply for playing games. First of all, this keyboard is smooth. It’s the smoothest, most fluid typing experience I’ve had on a keyboard. More important, even with the significantly earlier actuation it responds almost like the Unicomp. I think this may be due to the way the slight difference between click and registering balances out on this switches key travel. I’m a touch typist. When in practice, I’m around 70wpm. Not “pro” speeds, but far, far faster than the typical hunt-and-peck. A good keyboard supports your typing. It doesn’t hinder it. That is exactly what the BlackWidow does. When I’m typing slower than normal or when I make errors, the problem is me and not the keyboard. I have typed on Das, Filco and other high end keyboards and this keyboard is not only cost competitive (and rather cheaper than a Das), but also a better typing experience. Quite simply this is the best typing computer keyboard I have used since 1977. Let me also add a few comments about the form factor. First, while this keyboard is plastic in construction, it is solid and it is heavy. It clocks in at over 3 lbs, putting it in the same weight range as the old Unicomp. For me, this is a good thing as I prefer a weightier, more stable keyboard. The USB cable is braided, heavy and has a quality feel. Finally, this keyboard does not have a lot of frills. 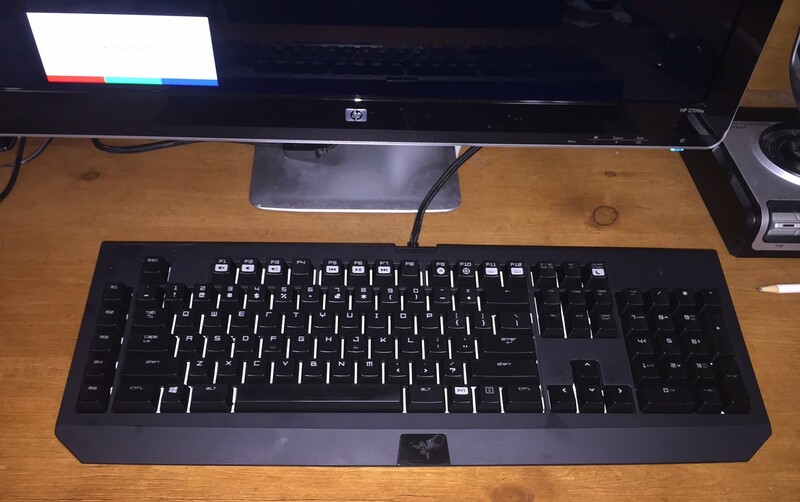 There is a vertical row of 5 macro keys on the left. Some of the function keys have secondary multimedia uses. That’s pretty much it. It does support a gamer mode as well as macro recording, but those are also mapped to the function keys. It also does not have an extended palm rest. Again, that is a good thing for me, good hand position means a palm rest is useless. It does have a USB port and audio input/output on the side, which can be convenient. I have the USB connected for a convenient port, but haven’t bothered with the audio. I’m already surrounded by mixers, rack gear and mics, so that feature is pretty pointless for me. It gives me the tools I need as a keyboard, does that job excellently and does little else and those few things are well thought out. One final physical aspect of this keyboard does need to be mentioned. Just like a buckling spring or Cherry Blue keyboard, the BlackWidow is loud. I like hearing that chainsaw buzz when I’m flying along in the groove with a new blog post pouring out of my fingers. It gives me comfort. It is a part of the zen of writing. If the noise bothers you or if you need to work in a quieter environment, then go with the Stealth models using the Razer Orange switches. I’ll close with some practical considerations. I’ve only been typing on this keyboard for 9 days, as of this writing. I don’t know what it will be like in a few years. That said, the BlackWidow Chroma does come with a one year warranty rather than 90 days like most keyboards. More telling, in the 2016 Ultimate, which is using the exact same switches, Razer has just upped the warranty to two years. That shows a good track record and manufacturer confidence. Buckling springs keys are rated for a 25 million keystroke lifecycle. Cherry switches are rated 50 million. These Razers are rated for 60 million keystrokes. In short, I’m expecting a very long life from this keyboard. The other consideration is cost. I’ll be honest, there was a time when I wouldn’t touch anything Razer. The gear was reasonable quality, but in my opinion far overpriced. That’s changed. Prices have become much more competitive. In fact, for a similar Das keyboard, I would likely have to pay more. Speaking of “pay,” what do these Razer’s cost? Depending on the model/features, the MSRP is between $99.99 and $169.00. Street prices are commonly $20-25 less. This puts one right in the sweet spot for a top notch keyboard. If you value your wrists, need to type reliably and accurately and want a durable and long lasting product, that is an excellent price. Yes, I still consider the Model M buckling spring keyboard the gold standard. I do so because these keyboards set the standard back in 1983. However, if you want a keyboard that exceeds that standard, then take a serious look at the Razer BlackWidow keyboards using Razer (not Cherry) switches.